Synopsis: Lawyer Sam Houston is invited by President Jackson to lead the fight for Texan independence. 51-year-old Joel McCrea (Bird of Paradise, Foreign Correspondent) was growing a little long in the tooth when he made this film about Sam Houston’s part in the accession of Texas to the Union. There’s something vaguely disturbing about him romancing the yummy 24-year-old Felicia Farr (3:10 to Yuma) – a bit like watching your uncle trying to get off with your little sister – and he doesn’t really have the youthful vigour that his part demands. I’m not sure how true to reality the movie is – not very, probably – but it manages to make a fairly dull plod of it anyway. 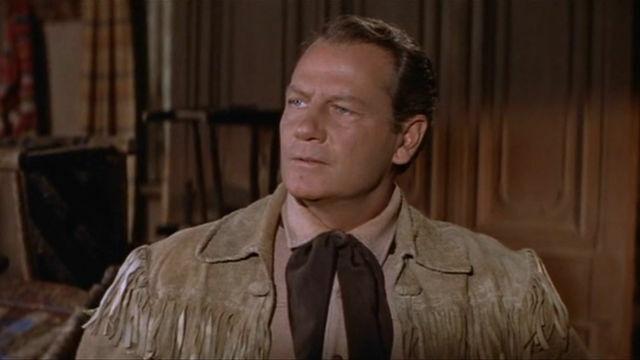 The cast features Western heroes such as Davey Crockett and Jim Bowie, but they’re very much secondary characters with their deaths – and the fall of the Alamo – taking place off-screen. It’s a fairly old-fashioned movie, even for the mid-1950s, not helped by an obvious lack of money – Houston’s army of 300 looks more like 30 – and director Byron Haskin’s unimaginative use of colour.